Jalaluddin Mohammad Akbar is one of such great kings of Hindustan (now India). Long back I read about him in few magazines and those words were blurred in my mind until I watch Ashutosh Gowarikar’s movie “Jodha Akbar”. The movie reveals Akbar’s initial days of married life. The movie made me start thinking and liking more about this great mogul emperor. Akbar’s religious innovations and policies towards the practice of unifying Hindu-Muslim were one of the greatest attempts in history. Akbar’s life story always motivates to have new enthusiasm, encourage to do something special and evoke to become strong, stable and calm. His life is evident for confronting challenges by not only resolving them also striving to reach new heights. 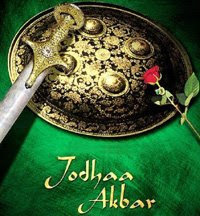 You know that this is not true - Jodha Akbar is historical fiction. 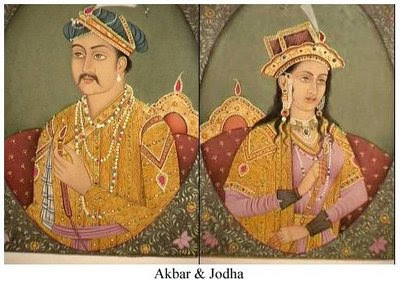 Infact there is no historical record of Akbar ever marrying a wife named "Jodha". He did marry an unnamed Rajput princess, and she did not have any position of influence in his court. Thanks for reading my blog and posting comment. Though there is controversy on the name, about it waz who exactly known in the name "Jodha"...Historically it is true that Akbar had married the elder daughter of King Bharmal of Amer (jaipur),her real name waz Hira Kunwar also known as Harka Bhai,nd the mughal honoured her with the title Mariam Zamani (Mary of the age),it waz a title not name,and she had strong influence in his court too. she could issue official documents (singularly called farman), which was usually the exclusive privilege of the emperor.And the controversy is only on the name..not on the relation portrayed in the film..as in one version the fiction is that she came to b known as jodha bhai..bt the another view is that it waz Princess Manmati of Jodhpur,Jodha's niece,who married her son Jahangir,came to b known as Jodha.And in the introduction itself the film clearly says about this controversy on name..and also.. the relation portrayed and icidents are historically true..so there is no need of making such a bad impression about the film. The movie really portraits that "Akbar the Great". Then the love between "JODHAA" and "AKBAR" was great to the extreme.After seeing this film i got more interest towards history. Now I am a Mughal history buff and I went to watch this movie expecting it to be a good one. But yeah, I was disappointed. The director portrayed Hirabai/Harkhabai (I refuse to identify her as Jodha) as the first and only wife of Akbar. Whereas, he had married Rukhayya Begum and Salima Sultana Begum much before he married the Rajput princess. Despite Rukhayya and Salima being childless and Hira being the mother of Salim, it were the former two wives who were Akbar's chief queens. They weren't even shown or mentioned in the movie. Even the Maham Anga, Adham Khan episode was messed up. whatever it may be, as no one know the very true facts but the story is too interesting that it rose a n avid interest of medieval history in my mind.